After a summer hiatus to correspond with most of our favorite shows going off the air, SNAP JUDGMENT is back at Give Me My Remote! What is SNAP JUDGMENT, you ask? Every day we’ll pick our favorite promotional picture from that night’s new television episodes and we’ll showcase it here. Then you guys can speculate what goes down in the scene/what you’d like to see happen/caption the pic however you want in the comments section. So which show is featured first this season? 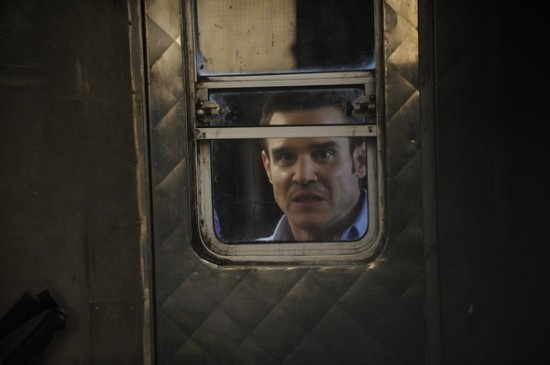 Yes, technically it’s still a summer show, but the look on Eddie McClintock’s (Pete) face in this shot is pretty priceless and should inspire you guys to come up with some witty comments. Have a thought about what’s going down? A far-out theory? Perhaps a snarky quip? Leave it in the comments below and make sure to check back on Tuesday to see which show will be featured!